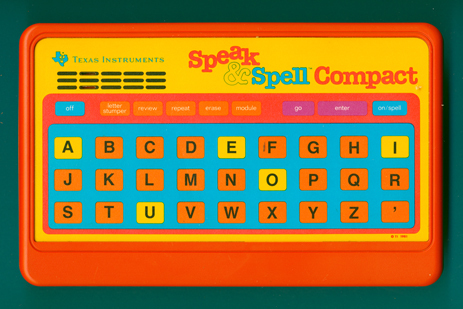 Think about the original Speak & Spell without a display. A slightly different version was sold in United Kingdom as Speak & Write. The Speak & Spell project was started in the year 1976 and created with the TMC0280 the first one-chip LPC speech synthesizer. Later refinements to the Speak & Spell chips resulted in the TMS5100, 5200 and 5220 Voice Synthesis Processors (VSP) for use in commercial products needing synthetic speech voice output from digitally-stored words and phrases. Speech data was stored in in up to sixteen 128K ROM chips (TMC0350). Press the Play button and listen Speak & Spell Compact tunes. Interested in the music of Dirk? Follow this link to his MP3 site. © Dirk Bohlig and Joerg Woerner, December 5, 2001. No reprints without written permission.